It's not much, really. I just sit there and open my heart. Think of the people I love. Tune in to joy. Oh well, excellent communication skills are imperative. Knowledge of Reiki history. Ethics. Compassion. Presence. All of that. Then I just be. There. For you. And tune in to joy. 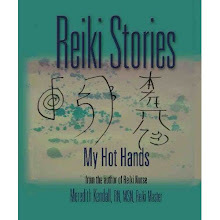 I just met you, but I can share Reiki with you. Joy, love, light. We each had an hour; table time, talking, and processing. We did mostly Reiki, but integrated other modalities too. We used a lot of stones and crystals. D went first. While I worked on D I saw a parade of ducks, bunnies, and fish. They went by three times. What was that about? It was like a child's parade, almost a cartoon. Ducks, bunnies, and fish. I have no idea. Then I saw steam rising from her body. A release of the stuff she didn't need. Then it was my turn. I experienced clarity and knowledge of my next steps. I felt T place a big heavy rock on my chest, a great pressure; except she didn't. T went last. I saw her swimming in a pond or pool. I placed stones around her head. D laughed as she felt the energy go through. I meet with two women for a healing circle. We met in the winter and today. We decided to meet quarterly. We connected at a Reiki Share, finishing each others' sentences, sharing thoughts, and getting each others' jokes. Perhaps we shared a past life or two. Maybe the one in the Scottish stone spiritual retreat. We wore brown linen robes and fur shoes in that life. We meditated and prayed, wandered the stone halls. I see images of that life when I practice with T & D. We decided to invite L to our next meeting. Today it went like this. We had lunch first, salad and iced tea. There was potato salad with hard-boiled eggs: what a treat. Kale with piquant dressing and fresh grated Parmesan cheese. Pasta salad with beets and shredded carrots. I brought pasta salad too. I was nervous about a potluck. Most people don't like my cooking. First I boiled tiny teff grains for a teff salad. It turned out like mush and congealed into a solid mass. I started over with whole wheat macaroni. Cooked the macaroni, added mayonnaise, salt, slivers of dried hot red pepper, and chopped sweet green pepper. Chopped and put everything into containers to layer once I got to T's house. The greens went on the bottom, greens fresh from my garden: spinach, red lettuce, cilantro, basil, and chives. Next a layer of chopped cucumber. Then the pasta. Spicy paprika, topped with sunflower seeds. After lunch we did the healings. Went to a haunted house today. A friend had some business there and I went along. too scared to look around, too scared to take pics, too scared to stay inside the house. Yeah, it was like that. big old mansion. Front door wide enough to allow entry of women wearing hoop skirts. First thing I noticed was the gorgeous wallpaper, then the detailed woodwork and antique furniture. I love all that stuff. Then I noticed the ghost on the stairs and another in the parlor. Both wanted me to leave. It felt like there were more spirits. None extended a warm welcoming greeting. There was one spot where I was semi-allowed to sit in the parlor, and one spot on the front porch. I opted for the porch and was so glad when we left. I cleared myself and we headed for places with happier energy. Ran out in the rain yesterday to scatter coffee around the seedlings, protect them from slugs. It worked. They're all ok today: eggplant, basil, tomato, and bean. Peonies, not yet, almost. My favorite flower. The lush ephemeral blossoms, symbiotic ant relationship, and dark glossy leaves. The fragrance. Morning glory, marigold, and sunflowers sprouted. Harvesting spinach and could do kale. Potato in hay seems to be working. Lots of potato sprouts in there, along with the morning glory. Neighbor most unhelpfully whacked the streetside seedlings along the fence. I might have expressed anger, just for that day. The garden is a glory of color, energy, peace, and future abundance. Shared Reiki at a cancer survivor day at the local cancer outpatient center. I spoke, showed some slides, and a group of us shared Reiki with the mostly geriatric crowd. The guests raised their hands if they wanted Reiki. They all wanted it. I stepped behind a short woman with white hair and a pretty blouse. I placed my hands on the top of her head and tuned into the energy. Reiki. After a few minutes I moved my hands toward her ears and heard a high-pitched shriek. What was that? I froze and looked around. What was that sound? 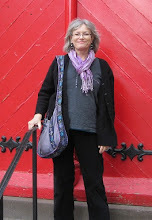 She quickly moved her hand toward her ear and pulled out her hearing aid. I did that? With my hands? I hadn't even touched her ear, had just moved toward it. I leaned over and whispered in her ear, "Did I do that?" "Yes," she replied. "You did."